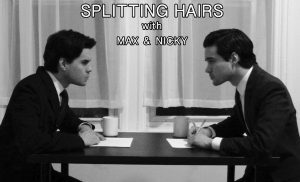 SPLITTING HAIRS with Max & Nicky, a podcast in which the twins pick apart, deconstruct, and overthink topics that interest them. Tune into the first 50 episodes of Splitting Hairs on iTunes as Max & Nicky delve into fascinating and thought-provoking topics, including TV show theme songs, dating apps, alcoholism in the media, PDA, social media, and MORE! Max & Nicky delve even deeper into the very contentious and very current topic of gun control. Max & Nicky discuss their feelings on life changes. Max & Nicky discuss the all-American tradition of going to summer camp. Plus, some post-Oscars talk. Max & Nicky discuss why they enjoy watching At the Movies with Siskel & Ebert despite their frequent disagreement with Siskel and Ebert’s film reviews. Max & Nicky finally get around to discussing the extremely important topic of shoes. Max & Nicky compare and contrast several grocery stores with special emphasis on Trader Joe’s. Max & Nicky talk about chips from potato to tortilla to the TV series (kidding about the last one). Max & Nicky discuss all things Cobra Kai, the new Karate Kid sequel YouTube series. Note: Max & Nicky make a mistake in referring to a character in The Karate Kid III as Terry Price. The character’s name is actually Terry Silver. Max & Nicky discuss the impact YouTube has on the current media landscape. Plus, some talk about the Broadway shows they’ve seen in the past couple weeks. Max & Nicky discuss game shows and their influence on modern culture. Also, some talk on Mr. Rogers and the new documentary about him. Max & Nicky discuss some of their favorite and not-so-favorite sodas and the major problems with diet sodas and aspartame. Max & Nicky are joined by Kevin Crooks for an in depth discussion on the documentary, Los Angeles Plays Itself. Plus, some Phantom of the Opera talk.